In the do-it-yourself era, installing wood floors looks like a simple enough task for the budget-conscious home renovator. The home show industry is fueled by like-minded individuals whose initiative compels them to do for themselves. This leads to wondering just how hard can it be to install a hardwood floor yourself? Simple as a concept, there is a little more to installing hardwood floors than it appears at first. The long-term success of any strong, durable wood floor rests on impeccable installation. And with a little extra knowledge, the do-it-yourselfer can have strong, beautiful floors to be proud of. A good wood moisture meter plays a vital role in wood flooring installation preparation. A wood moisture meter measures the moisture content (MC) inside wood. Just touching the wood surface, or assuming a certain amount of time for the wood flooring to equalize to its new environment should be adequate, simply cannot pinpoint potential elevated moisture areas within a wooden subfloor, or in the wood flooring itself. 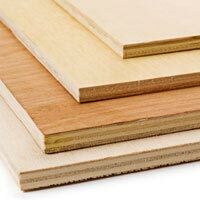 In addition, unfortunately, wood that has not reached its equilibrium moisture content (EMC) can be subjected to a number of potential flooring problems in the future that can be very troublesome to repair after they have appeared in the wood flooring. Put simply, EMC is a balance between the wood’s MC and the relative humidity (RH) of the air surrounding it. Wood moisture meters come with a variety of features, but the most important one for the do-it-yourselfers is to verify that the meter being used has a setting for the wood species of flooring that is being installed and that the correct species setting is being used. 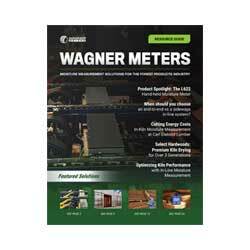 Wood moisture meters like the Wagner Meters’ Orion® line have programmable wood species settings for hardwoods, softwoods, and exotic tropical woods. Engineered wood flooring may present more of a challenge when selecting the appropriate wood species settings (check for manufacturer’s recommendations), but accurate wood MC measurement is the only way to ensure step-by-step success for your wood flooring installation. Wood subfloors need the same MC assessment as the selected wood flooring coverings. When installing hardwood floors, do-it-yourselfers must ensure that the subflooring is also moisture-safe and ready for the wood flooring installation. Lumber manufacturers dry wood to a standard MC level depending upon the end product’s application specifications. Installers still need to check wood subfloors and wood flooring products to verify that they are dry enough for an installation to proceed. Each shipping location between the lumber mill and the jobsite can have different ambient conditions, and any wood flooring product usually must be allowed time to acclimate to its new surrounding environment before being installed. For wood subfloors, you should test for moisture at several locations in the room with a minimum of 20 test locations per every 1,000 square feet and average the results. Pay special attention to exterior and plumbing walls to rule out any potential problems with plumbing, leaking appliances or water intrusions below the subfloor. In most regions, a dry wood subfloor that is ready to work has a MC of 12% or less. If you record excessively high MC readings, do not proceed with the installation until the origin of the moisture is identified and eliminated. Concrete subfloors can also be subjected to moisture-related issues, and new slabs should be tested using RH testing to be sure they are adequately dry. Existing slabs should also be tested to rule out any sub-slab water intrusion. Your selected wood flooring usually needs to reach its EMC before you begin installation. Review the manufacturer’s specifications on how long the wood flooring should acclimate to its environment before installation. Also, the building should be enclosed with the heating or air conditioning set to normal living conditions for temperature and RH purposes. Acclimation of the flooring can be facilitated by opening the wood flooring packages and stacking the flooring with ¾”-1” stickers in between each layer of flooring to allow air circulation to reach the flooring. Upon delivery of the wood flooring, check it with a moisture meter to establish a MC baseline for acclimation purposes. Check the MC of typically 40 boards for every 1,000 square feet of flooring. 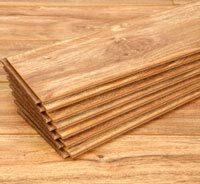 Periodically check several samples from each package to determine when the flooring has reached the recommended EMC for that wood flooring species. Again, acclimate the wood flooring to the manufacturer’s specifications or as necessary according to geographical location and your jobsite location. A pinless moisture meter lets you quickly and efficiently scan individual boards for an MC assessment without causing damage to the wood flooring. When MC readings are stable and within manufacturers specifications, the wood flooring is ready to be installed according to the manufacturer’s recommended installation procedures. Proper wood moisture meter practices help to preserve fully-installed do-it-yourself wood floors over time. Seasonal changes may still occur, but the natural seasonal effects of contraction and expansion of the wood flooring will be minimal in the life of your floor if the flooring was installed correctly. Do-it-yourself wood flooring installers save money and time by measuring the MC at all stages of the flooring installation, from preparation to preservation.